I start with quoting some words a colleague sometimes uses: "I didn't see this one coming"! The songs on this album took me by the balls and didn't leave them alone until the end. I never expected to be so thrilled by this band. 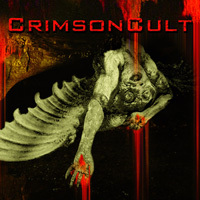 Reading the info I learned that Crimson Cult is the brand new band around the former Stygma IV members Günter Maier (git) and Alex Hilzensauer (bass). After the split of Stygma IV 2 years ago they always stayed in close contact and never lost the joy of playing music together. Bless them for that! "Evil Design" combines the speed and enthusiasm of Judas Priest's "Breaking the Law" with the heavy riffs of Black Sabbath's "Paranoid". Walter Stuefer's (also First Coming) powerful vocals fit perfectly to this style of music. Every song on this album has the same high quality and the beautiful guitarsolo's and the tight rhytmn section makes it complete. The keyboards they use stay in the background and are only used in favour of the songs. In general the band plays power metal with doom, inspired by: Memento Mori, Memory Garden, (Morgana) Lefay, Cage, Judas Priest, Black Sabbath and many more... My personal favourite is "Lava Machine", the heavy riff in this song sticks in your head and won't go away. You can compare this track to a heavier version of a song taken from Black Sabbath's 'The Headless Cross'. Without thinking I pushed on the repeat-button to hear it once again before going on with the sixth song "Dirty Demon" This is a slower rather heavy song leaning closer to doom, the higher more dramatic style of vocals in this song also see to that. Power metal fans (and then I don't mean the happy metal fans) that love heavy riffs, good arranged songs and a good powerful singer must check this out. I am sure this one will not leave my stereo any time soon. First band this year that applies for Newcomer of the year!